More and more people access content on the web via mobile devices these days. Your website should look great and be accessible to everyone, whether your website’s visitors are viewing your site on a desktop computer, a laptop, a tablet, or a smartphone. As of mid-2014, the estimated number of smartphone users in the US is now more than 150 million. That number will certainly grow over the next several years. Now more than ever, it is essential that your website look incredible and work flawlessly on devices of any size. Torx specializes in what is referred to as “responsive web design”. Responsive web design is the practice of designing a single website that looks and works correctly when viewed on multiple devices with different screen sizes. We build these sites so that they’re “smart” enough to know how to display content, text, photos, video, etc. in a manner that fits the size of the screen on which it’s being viewed. The goal is to provide the optimal user experience for everyone, whether an individual is viewing your website on a 27″ widescreen monitor or an iPhone. Though not a requirement, we do strongly encourage our clients to consider the concept of responsive web design when having websites created or redesigned. Do you have an older website that doesn’t look great on mobile devices? We’d love to help. Give us a call at 804-577-8679 or click below to contact us. The future is mobile. With an increasingly large number of individuals accessing web content via mobile devices, a responsive site ensures that your visitors have a positive user experience. 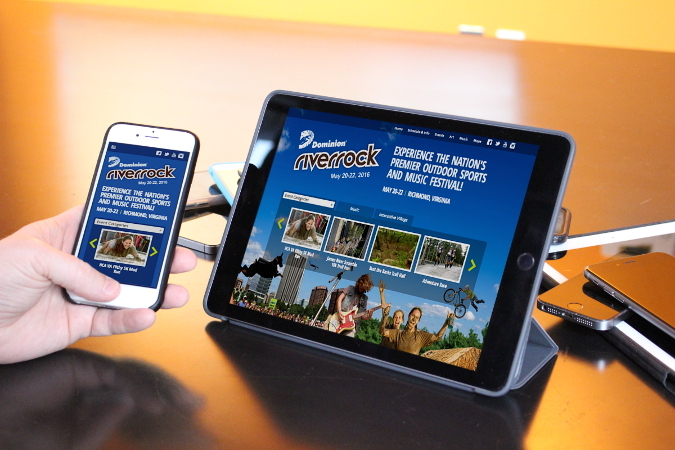 Properly designed responsive websites will work on mobile and tablet devices that haven’t even been released yet. They’re “future-proof”! Your site’s content can be easily edited just once, and those changes will appear to both desktop and mobile users. There is no need to update the same content multiple times for multiple screen sizes. For CMS-powered websites, such as those utilizing WordPress, responsive websites require less training. Responsive websites are less expensive than the development of a separate traditional and mobile-friendly site. Do you have an older website that doesn’t look great on mobile devices? We’d love to help. Give us a call at 804-577-8679 or fill out the form below to contact us.